There are at least three bands/artists with this name: 1) Three Roman Catholic priests from Ireland. 2) A rock band from New York 3) No-fidelity noise punk noise. Punk. 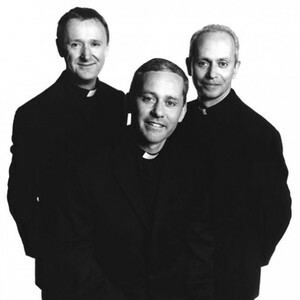 1) The Priests are three Roman Catholic priests from Ballyclare and Ballygowan in Northern Ireland who have been singing together since they were children. After signing a $2million record deal with SonyBMG in 2008 they have been recording an album in Ireland, London and have been allowed to record in St. Peter's Basilica, The Vatican. 1) Three Roman Catholic priests from Ireland. 3) No-fidelity noise punk noise. Punk. 1) The Priests are three Roman Catholic priests from Ballyclare and Ballygowan in Northern Ireland who have been singing together since they were children. After signing a $2million record deal with SonyBMG in 2008 they have been recording an album in Ireland, London and have been allowed to record in St. Peter's Basilica, The Vatican. Their debut album was produced by Mike Hedges who has worked with, amongst others, U2, Dido and Manic Street Preachers, and is released on 24th November by Epic Records. It will be launched simultaneously in 33 countries and precedes an ITV documentary and PBS special in America. * Father Eugene O'Hagan is of the Parish of Ballyclare and Ballygowan: Church of The Sacred Heart and Church of The Holy Family. Diocese of Down and Connor. * Father Martin O'Hagan is of the Parish of Cushendun: Church of St. Patrick (Craigagh), Church of St. Mary, The Star of the Sea (Culraney). Diocese of Down and Connor. * Father David Delargy is of the Parish of Hannahstown: Church of St. Joseph and Church of St. Peter, the Rock , Diocese of Down and Connor. The Priests' eponymous debut album recorded the biggest opening week of sales ever for a classical album. The Priests, the album, shot into the UK album chart at number five in its first week and also topped the classical chart in its first week of release. When the album was released in the UK, it was released in 33 countries at the same time and has already topped the charts in Ireland as well as making the top tens in album charts in countries as diverse as Spain, Norway and Sweden. Around the world, sales of the album ? which comprises spiritually inspired tracks such as Pie Jesu, Ave aria as well as great classical arias and traditional Irish - are soaring in the run-up to Christmas. In the United States, sales are growing fast in anticipation of a coast-to-coast broadcast of a special two hour PBS TV programme about the group. The trio are also the subject of an ITV documentary to be aired in the UK on December 14 telling the story of their incredible journey over the past 12 months. The Priests, Fathers Eugene and Martin O Hagan, who are brothers and their schoolfriend of 30 years ago, Father David Delargy, are signed up to Sony BMG's Epic label under a unique deal which stipulates that none of their recording commitments will ever be allowed to stand in the way of their day jobs of parish priests in their neighbouring parishes. The group is currently performing on tour in Canada and the USA and will be playing to massive audiences on a world arena tour next year. However, they will shortly be stopping all promotional work and other aspects of their recoding career in order to concentrate on the celebration in their parishes of the Christmas season. They have promised that a substantial proportion of the money made from the sale of The Priests will go to various religious based charities. Nick Raphael, managing director of the Epic label and the man who spotted The Priests, said: "It is incredible that, in the UK alone, their debut album has taken by storm an album chart in which it is competing with massive acts like The Killers, Guns N Roses, Leona Lewis and Dido. "It is also an incredible achievement that, in terms of the classical chart, sales of The Priests have outstripped anything that Luciano Pavarotti or more recently Katherine Jenkins shifted in the first week of sales for any of their albums." 2) This State-of-New-York foursome embraces the mythic garage-rock-psych sounds of yesterday while creating the music of tomorrow in their own image. Hypnotic guitar lines, fuzzed-out organ and tribalistic back beats build the foundations of their unusual and original sound. TALL TALES, the PRIESTS latest release and first for GET HIP was produced by the great TIM KERR in a whirlwind 4 day session at Saxon Studios in Rochester, NY. While maintaining their signature sound, the band has pushed their own boundaries, experimenting with guitar layers, feedback, vocal techniques and time lengths, creating an album destined for greatness. Spread the word.